An overview of the enhanced AAI theory version 2 you can find here. In this post we talk about the sixth chapter dealing with usability and usefulness. In the AAI paradigm the concept of usability is seen as a sub-topic of the more broader concept of usefulness. Furthermore Usefulness as well as usability are understood as measurements comparing some target with some presupposed norm. Example: If someone wants to buy a product A whose prize fits well with the available budget and this product A shows only an average usability then the product is probably ‘more useful’ for the buyer than another product B which does not fit with the budget although it has a better usability. A conflict can arise if the weaker value of the usability of product A causes during the usage of product A ‘bad effects’ onto the user of product A which in turn produce additional negative costs which enhance the original ‘nice price’ to a degree where the product A becomes finally ‘more costly’ than product B. Therefore the concept usefulness will be defined independently from the concept usability and depends completely from the person or company who is searching for the solution of a problem. 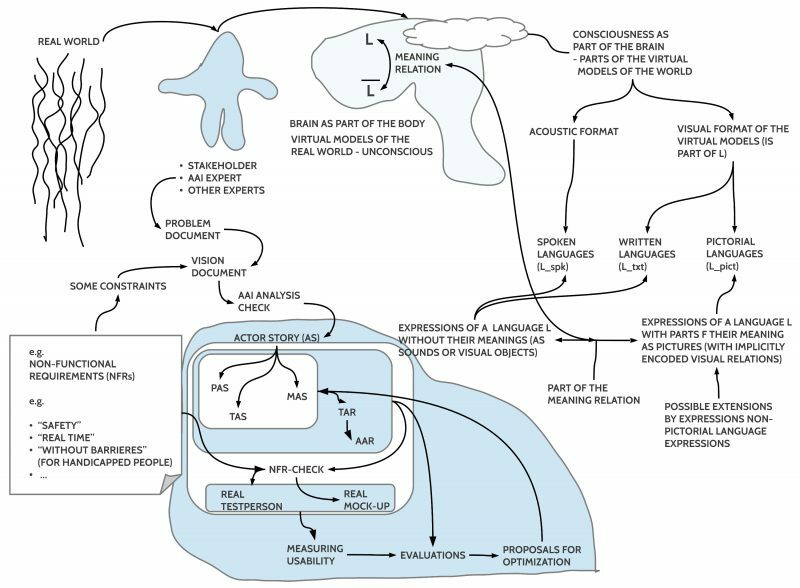 The concept of usability depends directly on the real structure of an actor, a biological one or a non-biological one. Thus independent of the definition of the actual usefulness the given structure of an actor implies certain capabilities with regard to input, output as well as to internal processing. 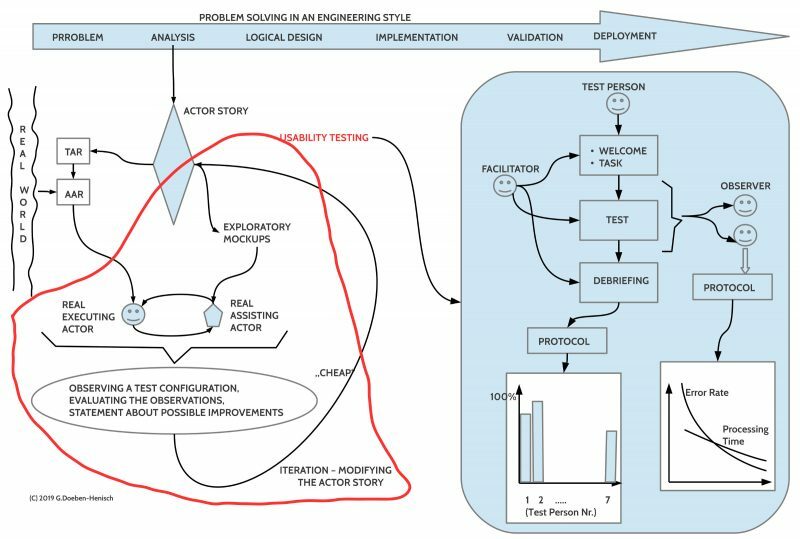 Therefore if an X seems to be highly useful for someone and to get X needs a certain actor story to become realized with certain actors then it can matter whether this process includes a ‘good usability’ for the participating actors or not. In the AAI paradigm both concepts usefulness as well as usability will be analyzed to provide a chance to check the contributions of both concepts in some predefined duration of usage. This allows the analysis of the sustainability of the wanted usefulness restricted to usability as a parameter. 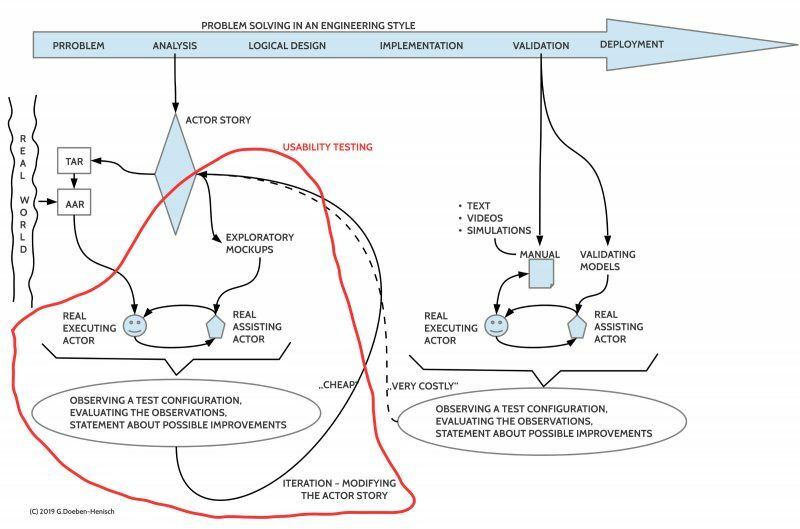 There can be even more parameters included in the evaluation of the actor story to enhance the scope of sustainability. Depending from the definition of the concept of resilience one can interpret the concept of sustainability used in this AAI paradigm as compatible with the resilience concept too. To speak about ‘usefulness’, ‘usability’, ‘sustainability’ (or ‘resilience’) requires some kind of a scale of values with an ordering relation R allowing to state about some values x,y whether R(x,y) or R(y,x) or EQUAL(x,y). The values used in the scale have to be generated by some defined process P which is understood as a measurement process M which basically compares some target X with some predefined norm N and gives as a result a pair (v,N) telling a number v associated with the applied norm N. Written: M : X x N —> V x N.
A measurement procedure M must be transparent and repeatable in the sense that the repeated application of the measurement procedure M will generate the same results than before. Associated with the measurement procedure there can exist many additional parameters like ‘location’, ‘time’, ‘temperature’, ‘humidity’, ‘used technologies’, etc. Because there exist targets X which are not static it can be a problem when and how often one has to measure these targets to get some reliable value. And this problem becomes even worse if the target includes adaptive systems which are changing constantly like in the case of biological systems. All biological systems have some degree of learnability. Thus if a human actor is acting as part of an actor story the human actor will learn every time he is working through the process. Thus making errors during his first run of the process does not imply that he will repeat these errors the next time. Usually one can observe a learning curve associated with n-many runs which show — mostly — a decrease in errors, a decrease in processing time, and — in general — a change of all parameters, which can be measured. Thus a certain actor story can receive a good usability value after a defined number of usages. But there are other possible subjective parameters like satisfaction, being excited, being interested and the like which can change in the opposite direction, because to become well adapted to the process can be boring which in turn can lead to less concentrations with many different negative consequences.